ThunderShirt's patented design applies a gentle, constant pressure that has a dramatic calming effect for over 80% of dogs. The most effective anxiety solution as voted by veterinarians, Thundershirt is already helping hundreds of thousands of dogs and cats worldwide as a medication free alternative for coping with storms, separation, travel and many other anxieties. 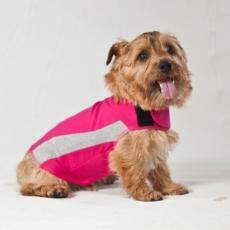 ThunderShirt Pink Polo is has a tailored fit in a bright pink colour with embroidered ThunderShirt logo.